U.K. Prime Minister Theresa May’s Brexit deal was defeated on Tuesday in the House of Commons — a vote she described earlier as "the most significant" in recent British political history — by a historic 202 to 432 margin, the biggest defeat for a reigning government in more than a century. Why it matters: No one is really sure what happens next. 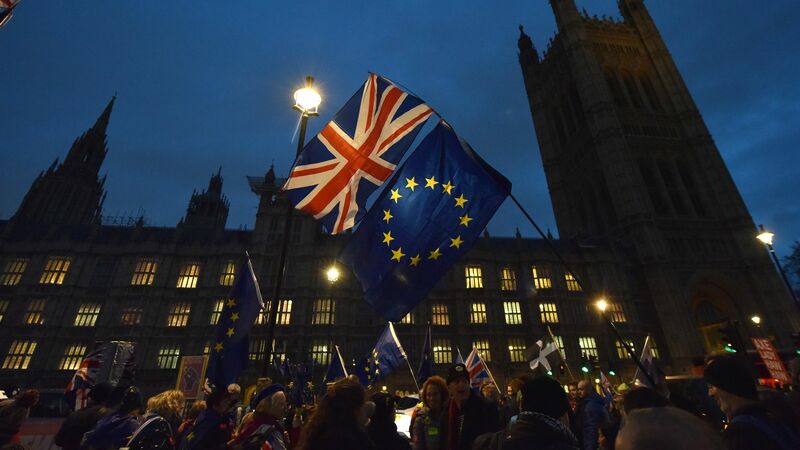 The U.K. is currently set to leave the EU on March 29, a step with economic and political reverberations that will last for generations, but it's not at all clear what that exit will look like — or if it will ultimately happen on time or at all. The big picture: Ahead of the vote, May told members: "A vote against this deal is a vote for nothing more than uncertainty, division, and the very real risk of no deal." By the numbers: There's now a 45% chance that one of three previously extreme scenarios — fresh elections (10%), no deal (5%) or a second referendum (30%) — comes to pass, per a new forecast from the Economist Intelligence Unit. Fresh elections: Labour leader Jeremy Corbyn immediately tabled a motion of no confidence in May’s government in an effort to force a general election. The conventional wisdom is that members are so fearful of a Prime Minister Corbyn that they’ll back May. But the conventional wisdom has a poor track record when it comes to Brexit. No deal: There’s little appetite in Westminster, or in Brussels, for the U.K. to crash out of the EU without a deal. The economic consequences would be dire. But Brexit Day is just six weeks away, and May says "no deal" is a "very real risk." She’ll almost certainly have to buy time from Brussels in order to avoid it. No Brexit: A second referendum has never looked more likely. A growing chorus says it’s the only logical step, considering no possible deal commands a majority in Parliament. European Council President Donald Tusk joined in today, tweeting: "If a deal is impossible, and no one wants no deal, then who will finally have the courage to say what the only positive solution is?" What's next: May is required to bring another plan before Parliament within 3 days, but she doesn't have much wiggle room, as the EU says it won't renegotiate the deal. If she can't find a solution that satisfies Parliament, a second referendum — which once seemed out of the question — becomes a very real possibility.